The school celebrated the raising of our first Green Flag on Thursday 5th June 2014. We had a great day of celebrations. Many visitors came to our school to celebrate this historic occasion. 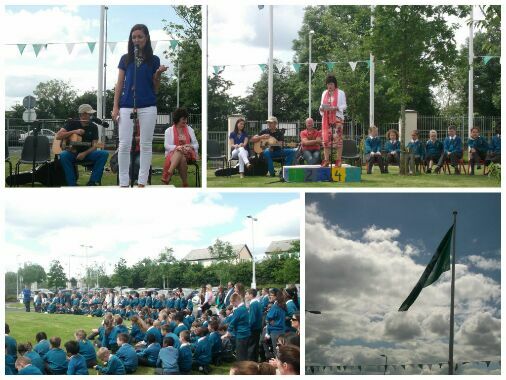 We were very honoured to welcome Luka Bloom to our school to raise our first Green Flag. Many thanks to everyone for all of the hard work in preparing for this very special occasion and to everyone who helped us celebrate it. This is our green schools area. We have a notice board, art, recycling bins, litter picking equipment and a battery collection area. We use recyclable materials for art work in school. 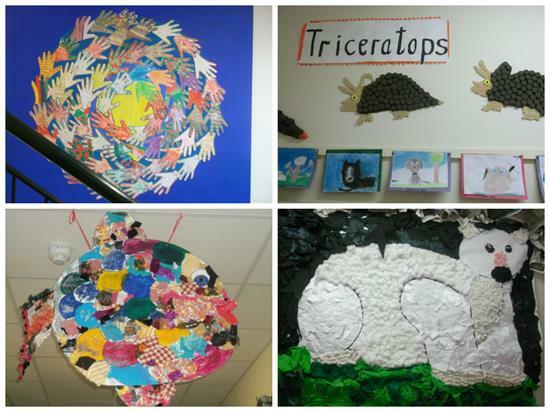 Here is a sample of some art work around the school made by the pupils using recyclable materials. We go litter picking in around the school twice a day. It is good to keep the school grounds clean and tidy. 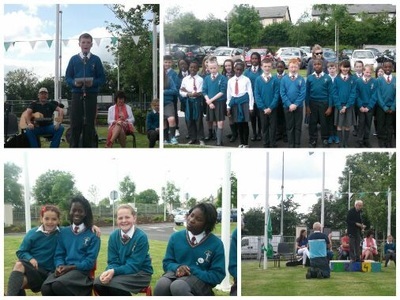 The first module of the Green Schools Project focuses on litter and waste management. 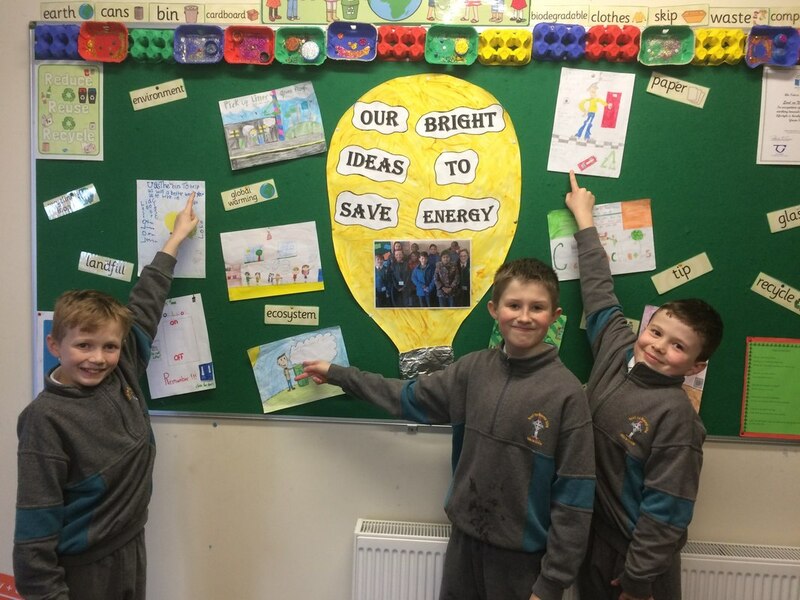 In Scoil Na Naomh Uilig we place a big emphasis on the 3 ‘R’s’- reduce, reuse and recycle. We promote litter awareness by teaching the children about litter picking, and recycling. 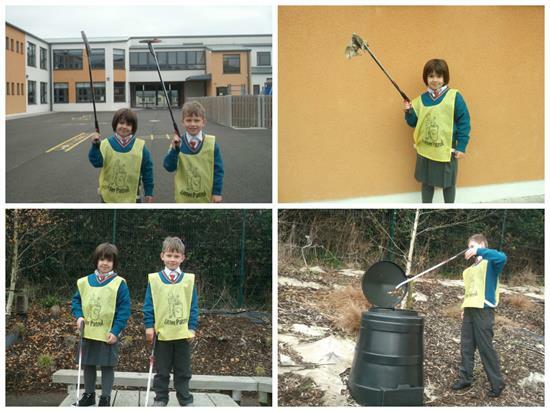 We have a litter collection rota organised each week where each class take it in turns to clean up our school grounds. The children are active participants in keeping our school clean and tidy and they all do a fantastic job. We recycle paper, card, batteries, stamps and mobile phones. We have two bins in each classroom, recycling and rubbish bin. All waste from our lunches is put into our lunchboxes and brought home. We use flushable hand paper towels in all our toilets which has cut down on our waste significantly. Last year we enjoyed planting carrots, lettuces and beetroot in our Sensory Garden and we look forward to the spring when we can plant again! We are a healthy eating school and we have a healthy eating policy Monday to Friday. We all took part in an art project last year where we made beautiful mosaics out of recyclable material for example bottle tops, old pieces of Lego and different types of beads. We all had great fun! Please don’t be a slob and help us to do our job. How will you help us do it? Pick it up and reuse it! Smile with me at the world you’re saving! USE THE BIN AND HELP US WIN A BETTER WORLD FOR US TO LIVE IN! Working Towards our Second Green Flag! Here are our newly formed Green Team, they have been working hard so far this year to keep energy use in the school to a minimum. They have made and distributed L.OLO posters to each classroom in the school. The team decided that Last Out Lights Off (LOLO) would be our motto as we work towards a Green Flag for Energy. 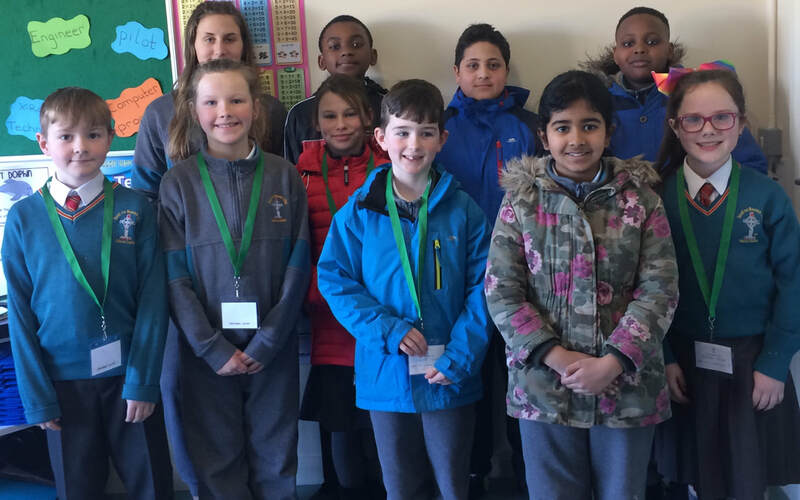 5th Class team members have been busy counting every appliance and light in the school while 6th Class gave out battery boxes to each classroom and reminded everybody that we need to continue recycling and being mindful of litter. Fourth Class had the difficult task of choosing artwork for our Green Schools Notice Board and Third Class have been working as door monitors during break times to make sure external doors are closed to prevent us wasting heat. They stuck up posters around the school reminding people that 'we don't want the heat flowing out the door, keep it closed to help us save more'. 2nd Class are now doing weekly meter readings to see how much energy we are using and we will use this information to decide how we can cut this down. We are looking forward to having Paul Finch coming to visit to teach us all about sustainable energy with his pedal power workshops! ​Open the blinds rather than turning on the lights! Take a look at this link to find some ideas of how you can save energy at home too! 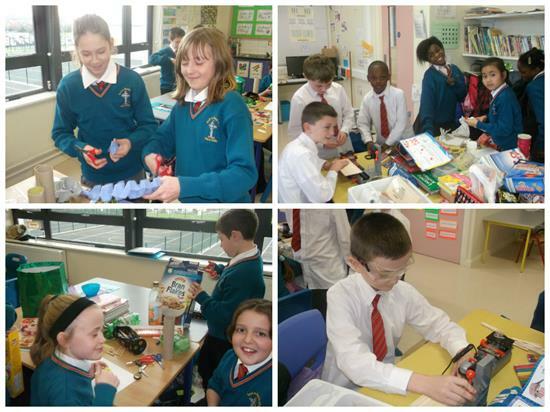 82% of 6th class students can identify renewable sources of energy. 70% of 6th class pupils shower for less than 10 minutes. 90% of 6th class pupils turn the light off when they leave a room. Open the blinds instead of turning on lights. Turn the heating down during the Summer. Switch off appliances when they are not being used.